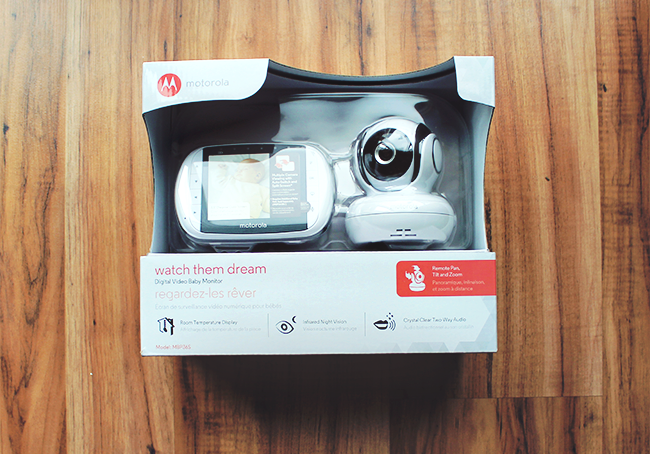 Before Essley was born, we were given a hand-me-down baby monitor. Although it's a little outdated, it served its purpose for the most part, and we were grateful to have it. Unfortunately, the sound began to crackle with constant static and the blurry video started to go in and out, so it became only partially effective. And of course, the need for a monitor increased right around the time that this one stopped working. 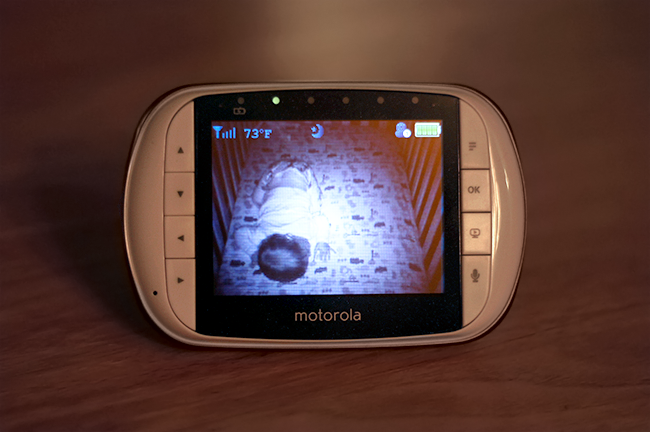 Essley is now crawling like crazy, standing, and even beginning to take some steps, both out of her crib and in it, which means that there is a lot more to have to keep an eye on than just a peacefully sleeping baby. She is also not a big fan of sleep in general, and will do just about anything to try to convince us that she needs out of her crib to play - whether before/during a nap, when we put her to bed, or in the middle of the night. We do always come check on her and/or get her if she is crying or seems distressed at all. And we do sometimes co-sleep as well. But for the times that she's making play sounds or giggling or chattering, I've wished I had an effective way to see her without her seeing me, regardless of where she was in her crib - because as those of you with little ones know, once they see you, it's all over. My favorite thing about the Motorola MBP36S is the fact that the camera (which showcases the video image on a full color LCD screen) remotely pans, tilts, and zooms. 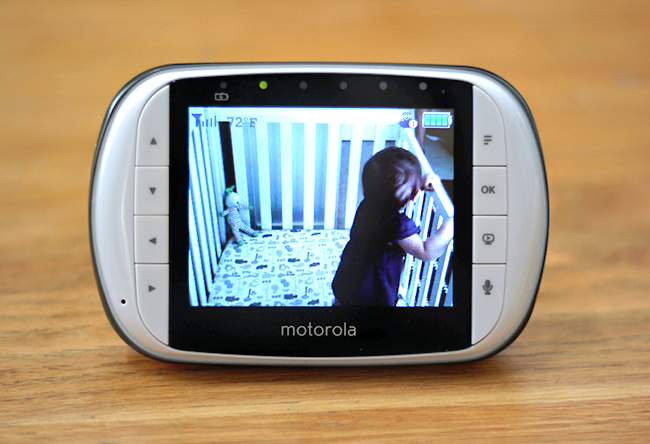 This means that no matter where my constantly moving child is in her crib, I can position the camera - from another room - to see her. The monitor also provides crystal clear two-way communication, which means when she thinks it's play time at 4 AM, I can say, "Essley, it's time to go to sleep," and she will hear me as well as if I was standing right there. Yep. It also plays five different lullabies, which means if my voice doesn't do the trick, I can remotely start playing "Twinkle, Twinkle, Little Star" (her favorite) from the comfort of my own bed. The infrared night vision allows for a clearer view of her at night than if I was in there with it, which is also a huge bonus. Oh yeah, and did I mention that there is room temperature display, so I know the exact temp of her room? As for the other stats, it has 2.4 GHz FHSS wireless technology, a 3.5' diagonal screen, a sound level indicator, volume control, a range up to 590 feet, ad out-of-range alert, a rechargeable battery, a low battery alert, a flip out stand on the parent unit, is expandable up to 4 cameras (additional baby units sold separately, Model: MBP36BU), and if you have more than one little one, you can view two baby units simultaneously with picture-in-picture technology. Phew. The biggest thing for us is the fact that Essley wants to party all night, and we were having a terrible time trying to get her to settle back down when she wanted to play, because the second she saw us in the room all hell broke loose. 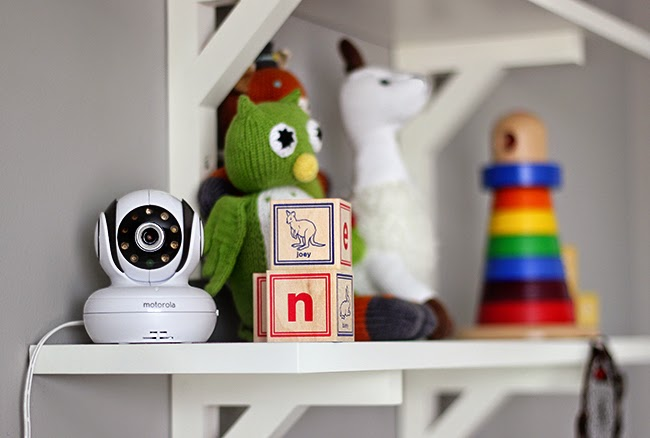 The Motorola MBP36S video baby monitor allows us to keep a close eye on her - and even communicate with her - without physically standing in front of here. Not only does that enable her to fall back asleep more easily, it also saves several exhausted trips from our bed to hers. I get it - sleep is probably all sorts of boring for a 10 month old. But mommy and daddy crave it, and baby needs it to stay healthy, and the MBP36S is proving to be incredibly helpful in the whole family getting longer, higher quality sleeps. If you're interested in finding out more info or purchasing the monitor, you can do so at Diapers.com. Who else has a baby/todder/kid who would rather rage all night than sleep? What do you do to help them settle down and get some freaking sleep already? That's a cool little device! I'm sure it gives you some peace of mind during the night! Yep, once they see you, it's over. My nephews are the same way. Neither of them EVER want to go to bed, so we'd just have to leave them up there singing (the toddler) and squawking in excitement (the baby) until they drifted off. This would've made that week babysitting in LA so much easier, haha. It's really cool that it zooms and pans! I don't have any children, but almost everyone I know does. I heard one friend complaining the other day that one of their littles had figured out the camera's blind spot in her room and would try to go hide there! 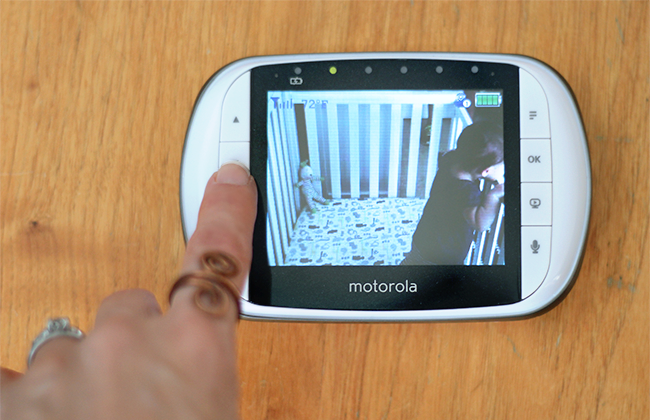 I'll have to mention this Motorola camera to her. This looks like a pretty effective monitor and I don't have kids but I'm going to tell my sister about it because her little one does the EXACT SAME THING. Sometimes it's hard to tell if he is upset or just playing and she's trying to get him to go to sleep on his own when he's just in the mood to play or happy babbling. I never had a cool monitor like this, but it sure looks like it could be really useful! 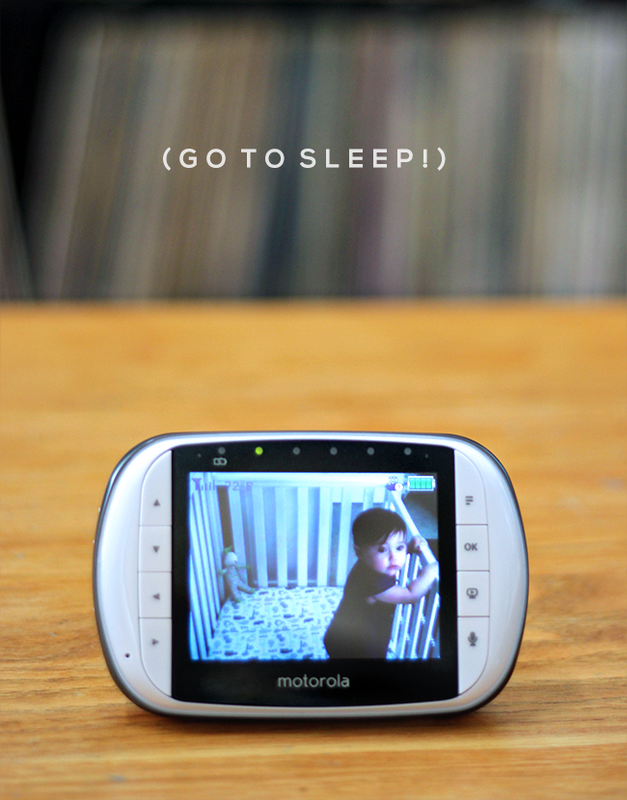 Boy baby monitors have gotten really sophisticated, I remember when all they did was broadcast sound so you'd know if baby was awake or asleep.